Explore Road to Hana with a local tour guide in your car! 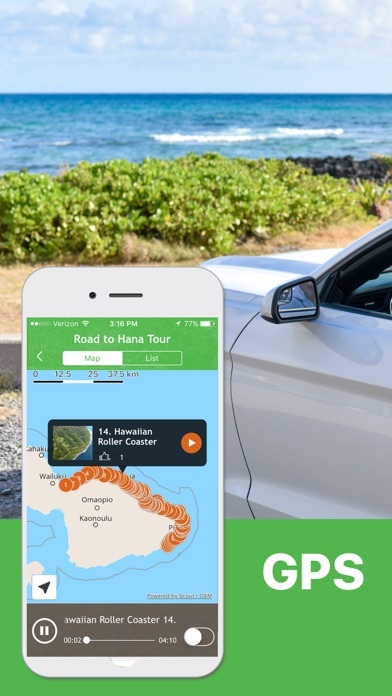 This OFFLINE app uses GPS to play audio narration, Hawaiian music, & turn-by-turn directions as you drive in Maui Only from Shaka Guide - 3 types of Road to Hana Tours: "Classic", "Loop" & "Reverse"! Made locally in Hawaii by local guides! 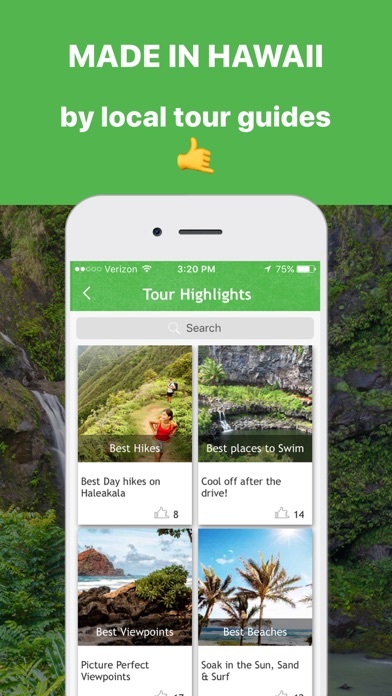 WHAT THE APP DOES: * Hours of audio with hundreds of narration points that play automatically as your drive * Made by local Hawaii tour guides * Hear fun stories, enchanting Hawaiian legends and things to do * Turn-by-turn directions with Offline maps (No data network required!) * Music by local Hawaii musicians (both modern and traditional) * Enjoy the freedom to travel at your own pace, while having the benefit of a local tour guide with you! * Better than guidebook with restaurants recommendations, things to do and see CLASSIC ROAD TO HANA TOUR Your Maui experience is not complete without Shaka Guide’s Road to Hana Tour. 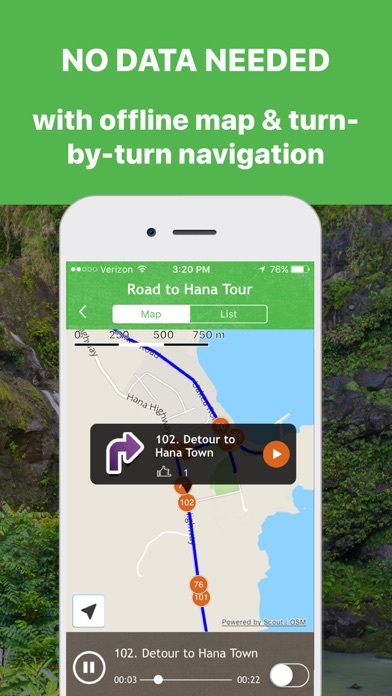 Let this app guide you the entire 42 mile stretch of road to Hana and back. On this epic journey you will discover: * Many little-known waterfalls, * Great little hikes, * Off-the-beaten-path swimming holes, * Beautiful White, Red and Black sandy beaches * A lava cave * Enchanting stories about the Kingdom of Hawaii. LOOP & REVERSE ROAD TO HANA TOUR Similar to the Classic version except instead of returning the way you came, it takes you around the island, allowing you to see both the dry and wet side of the island! Note that Loop and Reverse are the same tours except start and end completely opposite to each other. HALEAKALA NATIONAL PARK DRIVING TOUR Now with Sunrise and Sunset options! The tour accompanies you up to the summit of the Haleakala Volcanic Crater and back, stopping at all the best viewpoints and hikes along the way. As you cruise along, listen to stories of the park’s history as well as rich Hawaiian legends such as Maui, da’ Hawaiian Superman and so much more. WEST MAUI TOUR Take a trip around the West Maui mountains traveling along the Honoapi'ilani and the Kalehiki highways in a loop. Drive through the Historic old town of Lahaina, the famous resorts of Ka'anapali and Kapalua, before checking out an awesome blowhole! Then come with us as we wind along the high sea cliff roads, finishing the tour in the lush Iao Valley rainforest. 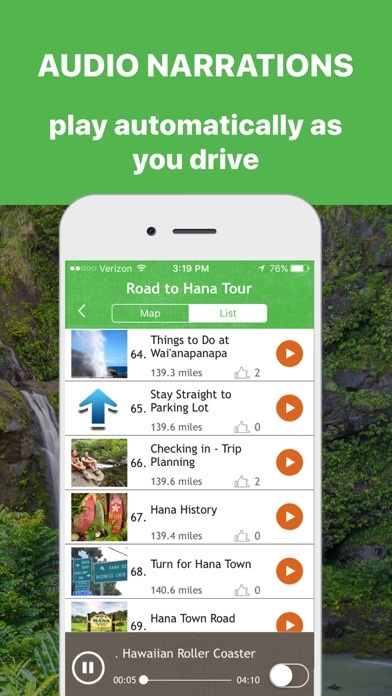 WHAT CUSTOMERS SAY: “Best Road to Hana Tour App” “Very Enjoyable, Cost-effective Maui Tour Guide” “Best money ever spent!” “Couldn't Have Navigated Without It” “Road to AMAZING! !” **Wifi-only iPads with no GPS capability do not support offline Tour** ** Shaka Guide uses your GPS only when necessary. But please remember that continual use of your GPS running in the background can dramatically drain your battery. This tour was awesome. We went to some places we would have otherwise missed. Get this! It is the best! This app was indispensable! Road to Hana tour was fantastic because of Shaka. He tells you exactly where you are and what is coming up next. We would have been lost without it. Whoever programmed this was brilliant. Thanks so much. Trust me....get this app before you go! Amazing. Absolutely fabulous and well worth the $10! My kids LOVED the guide and even named him. Would have missed MANY awesome places without him. Would use any of the other guides for other places. And the added history was a major bonus! This app is amazing! Super informative, works with offline maps, so even when you don’t have cell service the guide gives suggestions and Hawaiian history uninterrupted. This is my third time to Maui, first time using Shaka Guide and am SO happy that I was told about this app. The narrator is funny and entertaining, it feels like having friend riding in the car with you! This app is a MUST for Maui! The tour guide never gave his name that we heard so we named him Brad. Brad was awesome about giving us information and helping us with time checks. I definitely think it was worth the money! Thanks Brad! This has to be the best audio tour!!! We used the Shaka once before and we loved it - we learn so much about the surroundings area - history - it has just the right amount of everything - we love the narrator - he keeps you engaged! I purchased the Haleakalā tour the night before I was supposed to head up and despite being charged the full amount, the tour didn’t work. I reported the problem and requested a refund. I was provided with a generic email initially and within a few days, was notified that the issue had been as a result of a system bug. I again requested a refund for the Haleakalā tour because I’d be leaving the island and I have not received a response or acknowledgement. I was skeptical. But, the tour was amazing! It far and away exceeding our expectations! It was worth a lot more than $9.99! It took the full day to do our Reverse Road to Hana tour. In fact we had to skip many of the sights and just see what we could see from the car. You could easily get two full days of sights out of this one tour alone! Everything is easy to use, you feel like they are on the tours with you!